Pioneers in the industry, we offer diesel water pump from India. Backed by a team of dexterous professionals, we have been able to provide the customers with a remarkable Diesel Water Pump. Sophisticatedly designed under the guidance of our professionals, these pumps are widely utilized for agricultural purposes. 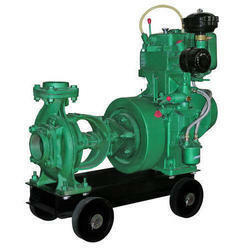 Highly acknowledged for their specifications and features, these pumps are available at market leading prices. Looking for Diesel Water Pump ?